When I run my fingers on my hair, something came off. 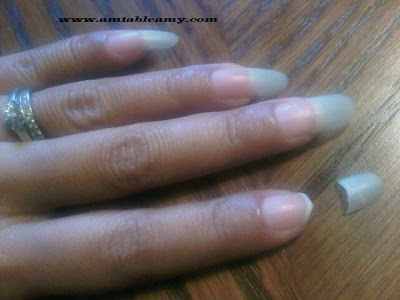 When I checked it out, my dear long nail was separated from its momma, LOL. Yep, I am laughing but was sad at the same time. I hate to see my fingers with short nails yet, that will gonna happen now. It's ironic that when my nails are short, these will get so dirty easily. Anyway, the picture here is a little bit blurry because of the weak home lighting that I used. Sorry about that.